On your sightseeing tour in each city, you’ll see the must-see sights, such as the residences of the Governor General and the Prime Minister in Ottawa; Québec City’s Place Royale, the historic square known as the birthplace of French America; Montréal’s Notre Dame Basilica, dating to the 19th century, where Globus has included an inside visit; and Toronto’s 1,815-foot-tall CN Tower, where you’ll enjoy lunch with incredible views. You’ll also visit Basilica of Our Lady of the Rosary in Cap-de-la-Madeleine, a national shrine with its fine stained-glass windows. But that’s not all…this Eastern Canada tour also includes beautiful scenery. A tour highlight is a cruise to see the thundering falls of Niagara Falls. You’ll also take a cruise through the waterways of Ontario’s Thousand Islands National Park. Plus, more picturesque scenery awaits you on your 7-night cruise to some of Canada’s historic towns and beautiful places. 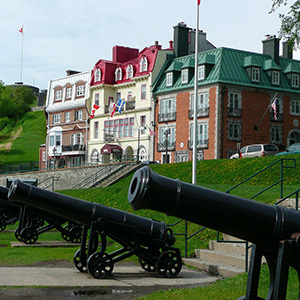 Ports of call include Québec City; charming Charlottetown on Prince Edward Island; Sydney, originally settled by Highland Scots; Halifax; Bar Harbor, surrounded by Acadia National Park; and Boston. Globus has also arranged special experiences to make your vacation unique. Enjoy a wine tasting and tour at a local vineyard in Niagara-on-the-Lake and a special dinner in Old Town Québec featuring regional French cuisine. Additionally, Globus has arranged a guided tour and breakfast at a sugar shack in Québec City, where you’ll learn the art of making maple syrup. This incredible tour and cruise of Eastern Canada is packed with fun and adventure-both on land and at sea! With everything Ottawa has to offer it can be tough to know what to do first when you visit. The obvious choice is a trip to Paliament Hill where you can take a tour of the centre of the political power in Canada. The first time you see the Peace Tower (other than on the back of a $5.00 bill), it is truly awe-inspiring.